Finance is considered as the lifeblood of a business. It has been considered as one of the most important functions of any business. Finance and accounting were considered as a discipline too technical and esoteric for non-finance professionals. However, it has been increasingly being embraced by professionals from across the domains like manufacturing, marketing, operations, human resources and information technology. This has led to this heightened awareness of the need to understand finance and accounting. Having recognized the need for today’s manager to be far more conscious of the financial impact of his/ her actions than his/ her predecessors, this course seeks to equip the non-finance professional with the basic set of tools and techniques from the finance and accounting discipline. Starting with the objective of the firm and an understanding of financial statements and analysis, the course progressively builds up on basic finance and cost concepts and aids the participant to apply these concepts in business situations that will lead to effective decision making. Working professionals across business functions and verticals who wish to inculcate key skills in finance and accounting. Graduates in any discipline with minimum 2 years of professional work experience after completion of graduation. The lectures will be delivered by eminent faculty from IIM Kozhikode. The approach to pedagogy combines live lectures, interactive discussions, case studies, class exercises and real time examples. The main objective of the assignments/projects will be to help the participants apply their conceptual learning in the programme to actual organizational decision scenarios. The participants will have to secure the minimum pass marks in the respective evaluation components. Participants who successfully complete the same and satisfy the requisite attendance criteria, will be awarded a Certificate of Completion from IIM Kozhikode. 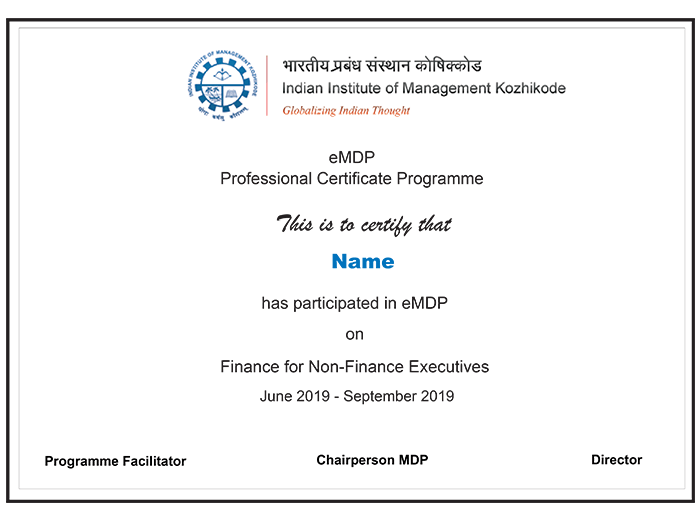 Participants who are unable to clear the evaluation criteria but have the requisite attendance will be awarded a Participation Certificate from IIM Kozhikode. 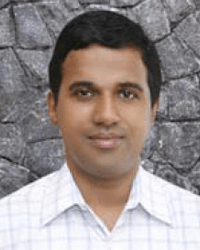 Dr Sudershan Kuntluru is an Associate Professor in Finance, Accounting and Control area at IIM Kozhikode. He has a vast experience in teaching executive education and management development programs in India and abroad. He was a member of an Accounting Standard Board (ASB), ICAI, New Delhi. His research interests include IndAS implementation and impact, earnings management and strategic finance. 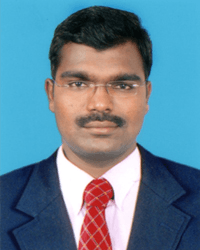 Dr. Sony Thomas is Ph.D. in Finance from Department of Management Studies, IIT Madras. He has conducted various training programmes in Finance to private and public sector companies. Prior to joining IIMK, he worked with Deloitte Research and GE Money-MSE Financial Decision Sciences Lab.